McDonald’s Accident Claim – Can I Claim Compensation For Injuries? Millions of people eat at McDonald’s every day. Eating fast food is a hugely popular way to eat out and McDonald’s in particular has become a standard household name. However, on occasion things can go wrong. Visitors to McDonald’s or employees of McDonald’s sometimes experience some form of accident or injury. This guide will explain the types of injuries that might occur whilst dining out or working at McDonald’s. It will explore who has the responsibility to keep people safe in McDonald’s restaurants and how you can claim compensation if you have been hurt. On the whole visits to McDonald’s will be safe and enjoyable but in restaurants that see so many visitors, the occasional accident is inevitable. If your injury was not your fault and can be attributed to negligence by the owners of the restaurant then you may be eligible for damages. Common claims include slips, trips and falls, food poisoning and burns. If you feel that you would like to make an accident at McDonald’s claim,then speak to Accident Claims today. We have a team of experts waiting to take your call. They will find out more about your case, advise you and seek to start your claim as soon as possible. Call us for free on 0800 073 8801. What are the main causes of injuries in McDonald’s? Staff and kitchen burn injuries in McDonald’s? What can McDonald’s accident and injury claims include? Why choose us for your accident claim? McDonald’s is an ever-popular UK restaurant with over 1000 branches which are usually operated as a franchise. Franchises are run by franchisees on long leases. Sometimes franchisees will run more than one branch. If a claim is made against McDonald’s, the franchisee is the person who the claim will be made against. If you have ever been involved in an accident at McDonald’s, whether at the drive through or dining in the restaurant then you may be wondering how to claim for your McDonald’s injury. There is an assumption when you are dining in a restaurant or order takeaway food that the owner will have ensured the safety of the food that you are being served. In the case of McDonald’s, it is the franchisee who is responsible for any accidents that happened where due care and attention has not been present. A franchisee in a McDonald’s restaurant is responsible for the health and safety of both customers and staff and for making sure that the environment is safe for all users. If you have been injured in McDonald’s either as a customer or as an employee, then you may wish to seek a McDonald’s injury settlement in an attempt to receive compensation for the accident in McDonald’s. This guide aims to equip you with the information you need to make a McDonald’s accident claim for the injury that was not your fault. Slips trips and falls There is a lot of scope for McDonald’s slip and fall settlements due to the amount of footfall in their restaurants and the amount of drinks that are served. Any occurrence of a leak or spillage can cause a slip hazard. Wet weather can mean that water is being walked in from outside making the restaurant area very slippy. The kitchens, which are full of fridges and freezers, can create leaks if they are not working properly. Slips, trips and falls McDonald’s injuries can include fractured bones, sprains and bruising. In this case, an employee in a fast food kitchen slipped on a wet floor and in an attempt to save himself, pulled over a vat of hot oil causing serious burn injuries to his skin which later required skin grafts. Slip and fall injuries can range from mildly uncomfortable to life-altering in their severity. Defective furniture. As in all restaurants, there are many tables, chairs and benches in a McDonald’s restaurant. If they are broken and have not been repaired or removed then they may collapse when somebody sits down. They may also have sharp edges which can cause cuts and lacerations. If empty boxes or pallets are left lying around, then they become a trip hazard and people may fall over the debris either in the restaurant or in the kitchen. If spillages of food and drinks are not cleared up immediately they can lead to slip, trip and fall injuries. Obstructions in the carpark leading to injury may also mean liability for the McDonald’s franchisee. Food poisoning. If food and drinks are not prepared according to the stated hygiene standards, then bacteria such as E coli may be present. Some food needs to be heated to a certain temperature to kill bacteria and if this doesn’t happen, it can lead to food poisoning in McDonald’s and people may become ill. Food and drink also needs to be stored correctly according to guidelines and if it is not, this too can lead to growth of bacteria which can then lead to McDonald’s food poisoning compensation. Car park accidents. One of the main causes of slips and trips in a McDonald’s car park is ice or snow. Slippery conditions caused by ice and snow can also cause cars to skid and crash. Potholes and manhole covers should be regularly checked because if they are loose or creating a trip hazard and somebody becomes injured then there could be a McDonald’s accident claim. 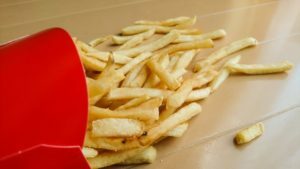 Scolds and Burns.McDonald’s claims department have previously dealt with many McDonald’s burn injuries which have been caused by food that is too hot. Examples of this include the filling from pies and extremely hot coffee. Burn injuries can also occur if hot drinks or food are spilt onto somebody. Lack of training or lack of staff. If there are too few staff, then employees may not be available to carry out the proper checks and monitoring of hazards. If staff are not trained properly then they may make mistakes with food preparation or use of equipment that can lead to the harm of either themselves, another employee or a customer. Hygiene and cleanliness. If the restaurant area or kitchen are not cleaned to the required standards, then people may become ill as a result of germs and contamination. If toilets are not working properly then there is a risk of flooding, leading to slips and falls. If baby changing equipment is faulty then this may also lead to a McDonald’s accident claim. It is the responsibility of the franchisee in charge of the McDonald’s restaurant to consider the health and safety of its employees and customers. In a fast-paced environment like McDonald’s there is a high potential to be injured at a restaurant as so much hot food and drink is being served throughout the day and people are moving around quickly. There are many opportunities for burn injuries and for spillages leading to slippery surfaces. Franchisees need to ensure that fire exits are well signed and maintained and that proper disabled facilities are provided. They are responsible for reducing the possibility of food poisoning or contamination of the food and for ensuring that furniture and flooring are well maintained and safe for people to use. A McDonald’s franchisee has a duty of care to keep their employees and customers safe and reduce or completely remove the possibility of slips trips and falls. In order to reduce the risk of somebody slipping, the floors of a McDonald’s restaurant and kitchen should be free of obstruction and spillages of food and drink should be cleaned up immediately. If a hazardous area has been identified, then signage should be put up to make both workers and customers aware of the hazard. They can then navigate around it. If you have been injured due to a hazard in a restaurant then even if a hazard sign was displayed, you may still be able to claim compensation for the accident at McDonald’s. It could be decided that the sign was insufficient protection from risk. Floors should be regularly risk assessed to ensure that they do not become too worn out and therefore slippy, service area floors should have a good level of grip. If you are thinking of claiming for slip trip or fall injuries in a kitchen, contact Accident Claims for professional advice on how best to begin your claim. Unsurprisingly, people who work in kitchens and food service experience more injuries due to burns than in any other job. People who work in McDonald’s are at high risk for burns injuries due to the fact that they work surrounded by potential risks. Hot oil and fat can cause serious burns and any spillage of these substances can be particularly hazardous. Spillages of hot liquids or burns caused by scalding steam can be extremely painful and serious for both employees and customers. Cookers and other kitchen equipment, whilst essential for heating up food to kill bacteria, offer the potential for numerous injuries too. Cooking equipment using a naked flame can prove to be a serious hazard in a busy kitchen. If someone experiences a McDonald’s burn injury,then they should ensure that they receive medical attention as this can stop the burn from causing permanent scarring or doing further damage. Here are the NHS guidelines for treating burns. The most common kitchen accidents that result in an injury are usually caused by staff not wearing appropriate personal protective equipment or PPE. PPE can protect the body from cuts, lacerations and burns. If you are working with equipment used to heat food such as fryers, grills and ovens then you may be at serious risk of injury if you are not wearing appropriate PPE. Unfortunately, in a McDonald’s restaurant employees need to work quickly to meet the demands of the customer and of the franchisees expectations. If you are not provided with the correct PPE or you are advised not to wear it and become injured as a result, then you can make a claim against McDonald’s for unsafe working conditions.Failure to wear PPE when cooking can result in serious burns and scalds which can lead to permanent disfiguration. In a fast-paced environment like McDonald’s, accidents can happen quite easily. Food poisoning is one type of illness that is fairly common due to the fact that food and drinks are prepared very quickly without the opportunity to double check individual items. If food is not cooked for an appropriate amount of time or not defrosted properly then bacteria may still be present and lead to food poisoning. See a medical professional whilst you still have the symptoms as your medical report could be used as evidence in a food poisoning claim. Inform the McDonald’s restaurant and make sure it is recorded in the incident book. Make a note of the witnesses who watched you eat the McDonald’s food and then become ill as their testimony may be required in a compensation claim. If by any chance you have a sample of the food which made you ill, then this may be useful as it could be tested to check what type of bacteria is present. Speak to a solicitor after you have completed the above steps to discuss how to take further action. pain and suffering as a result of your injuries. loss of earnings if you have been unable to work. general expenses such as transportation costs or child care costs incurred as a result of your injury. The cost of employing a carer to help you around the home if you are unable to carry out certain duties as a result of your injury. The case will usually be made against McDonald’s Insurance claims. If you’re thinking of making a McDonald’s accident claim and are wondering how much compensation you may be eligible for then the information in this table may help you. For a more detailed assessment of the damages you may be entitled to, speak to Accident Claims today and an experienced member of our team will be able to talk through the specifics of your case. Severe injury to the knee £19,900 - £73,125 Loss of function in one or both knees. Severe injury to the leg £73,150 - £103,250 Amputation of leg or legs. Moderate injury to the hand £4,100 - £10,100 Permanent damage to function of hand/s. Severe injury to the hand £22,050- £47,050 Amputation of one or both hands or arms. Accident Claims offer 100% no win, no fee claims. This means that while you are recovering from your injury you won’t have the financial worry of paying for a legal case to seek compensation for an accident in McDonald’s. With no win, no fee you will not pay anything upfront and our fee will simply be taken from your final payout if you are successful in your case. No win no fee is a stress-free solution to making your McDonald’s accident claim. With a highly experienced team of people who have your best interests at heart, Accident Claims are the premier choice to help you win compensation. We listen to the details of your case before offering expert advice on the best way for you to proceed. We understand that you will be going through a difficult time following your injury and we will do our best to gain general damages for your pain and suffering as well as special damages to cover any of the additional costs that you have been forced to pay as a result of your accident. You can contact us for advice 24 hours a day, 7 days a week. Contact us today so that we can help you to win the compensation you deserve following your injury. Our free phone number is 0800 073 8801, email us at office@accidentclaims.co.ukor use our contact form on the website and we’ll get back to you as soon as we can. These Health and Safety Executive links give examples of situations in which employees and customers have been injured in a fast food restaurant and illustrate why compensation claims come about.